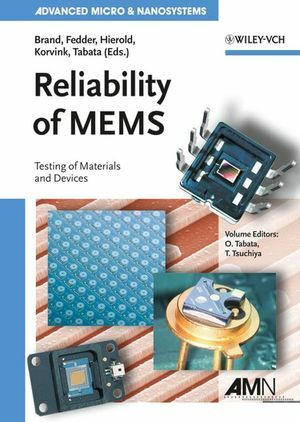 This first book to cover exclusively and in detail the principles, tools and methods for determining the reliability of microelectromechanical materials, components and devices covers both component materials as well as entire MEMS devices. Divided into two major parts, following a general introductory chapter to reliability issues, the first part looks at the mechanical properties of the materials used in MEMS, explaining in detail the necessary measuring technologies -- nanoindenters, bulge methods, bending tests, tensile tests, and others. Part Two treats the actual devices, organized by important device categories such as pressure sensors, inertial sensors, RF MEMS, and optical MEMS. Osamu Tabata received his Ph.D. degree from Nagoya Institute of Technology, Japan, in 1993. From 1981 to 1996, he performed industrial research at Toyota Central Research and Development Laboratories in Aichi, Japan. He then joined the Department of Mechanical Engineering of Ritsumeikan University in Shiga, Japan, and spent Guest Professorships at IMTEK Freiburg, Germany, and at ETH Zurich, Switzerland. In 2003, he joined the Kyoto University, Japan. Currently, he is the Professor at Micro Engineering Department. Professor Tabata is engaged in the research of micro/nano processes, MEMS and micro/nano system synthetic engineering (SENS). He was honored with the Science News Award in 1987, Presentation Paper Award in 1992, and received the R&D 100 Award in 1993 and 1998, Best Poster Award of 19th Sensor Symposium on Sensors, Micromachines, and Applied Systems in 2002, Best Patent Award from Ritsumeikan University in 2004. He is a senior member of the Institute of Electrical Engineers of Japan, a member of the Japan Society of Mechanical Engineers and a senior member of the Institute of Electrical and Electronics Engineers. Toshiyuki Tsuchiya received his Ph.D. degree from Nagoya University, Japan, in 2002. From 1993 to 2004, he carried out industrial research at Toyota Central Research and Development Laboratories in Aichi, Japan. In 2004, he joined the Department of Mechanical Engineering of Kyoto University and is currently Associate Professor in the Department of Microengineering. Toshiyuki Tsuchiya's current research is focused on mechanical properties evaluation of micro/nano materials and MEMS and micro/nano system synthetic engineering (SENS). He received the R&D 100 Award in 1998.